Sol concentrates his practice in the areas of Land Use, Development, Zoning, Corporate, and Business Law. He also focuses in Sports Law and is counsel to various head coaches at Universities and colleges including UConn, BU, and George Washington University. Sol has extensive banking experience in his 50 plus years as an attorney. He was a former Member of the Board of Directors of Vernon National Bank and New England Community Bancorp (New England Bank and Trust). 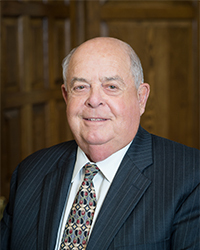 He was an Executive Board Member, General Counsel, and Secretary to the Bank of South Windsor, General Counsel to Tolland Bank, and a Founding Member and Director of Connecticut Bank & Trust Company. He also served as General Counsel to the Town of Tolland. His love of debate and family lineage fueled his interest in law as well as his desire to serve, which is evident in his extensive involvement with community organizations like the Vernon Economic Development Commission, the Land Use and Open Space Task Force of South Windsor, the Greater Hartford YMCA and as Director of the Rockville VNA.